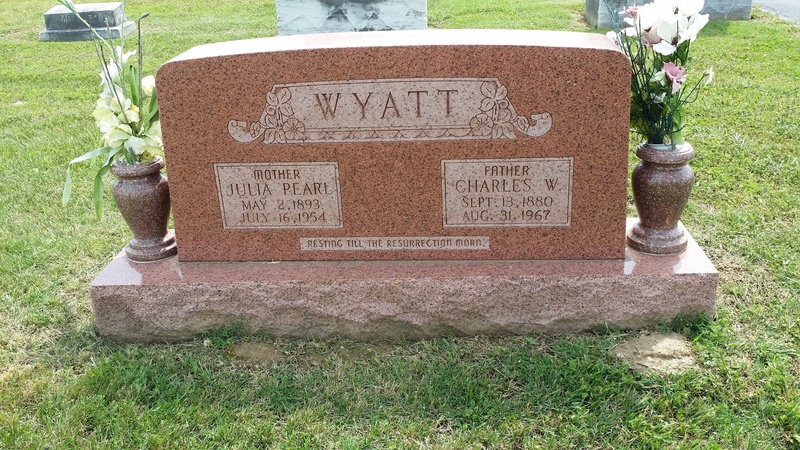 Gravestone of Mom’s Grandparents, Charles Washington “Wash” Wyatt and Julia Pearl Edmonston Wyatt. 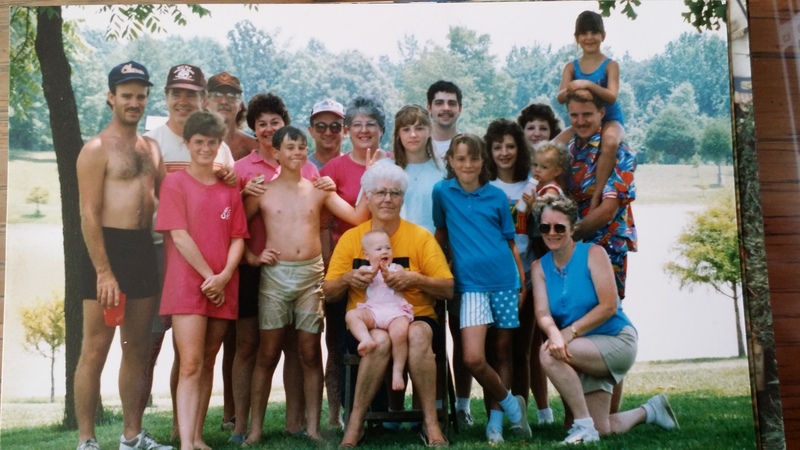 Family gathering at Pick’s Pond around 1988 or so. This past weekend my wife and I accompanied my parents to the annual Harvey’s Chapel Homecoming in Marmaduke, Arkansas (population 1,111). My Mother’s parents and at least two generations prior are buried there. 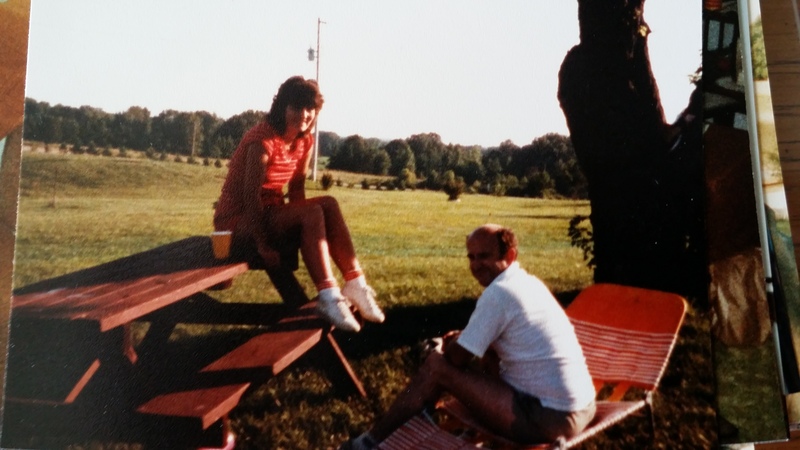 For the past few years I have been researching our genealogy and have built a fairly sizeable family tree using my grandmother’s 40 years of research on Dad’s side of the family, my Mother’s recollections and assorted notes, and Ancestry.com. I was excited to go to the reunion to meet cousins who might share my interest in genealogy and be able to help flesh out my tree. My most recent finds have been ancestors from England back into the 1300 – 1600’s (which I find really cool), but the time in Arkansas gave me a fresh appreciation of a more personal reason we traveled the 600 miles – to build relationships with friends and family and to experience a common life that we share as God’s children. 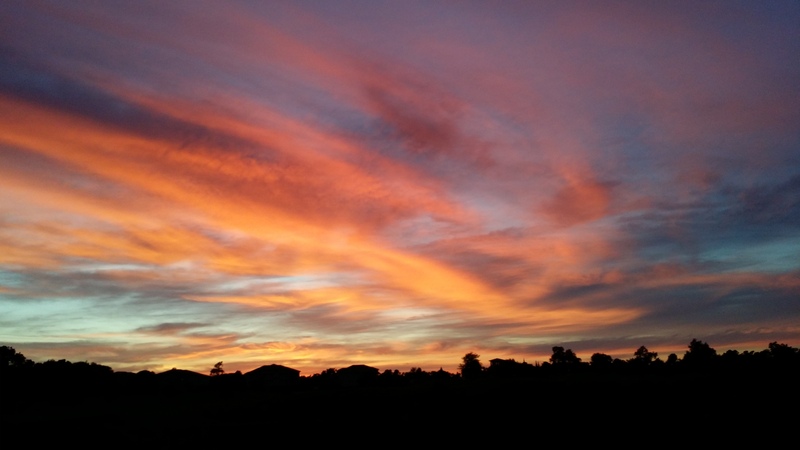 I want to share vignettes from the weekend that provided life lessons for me. 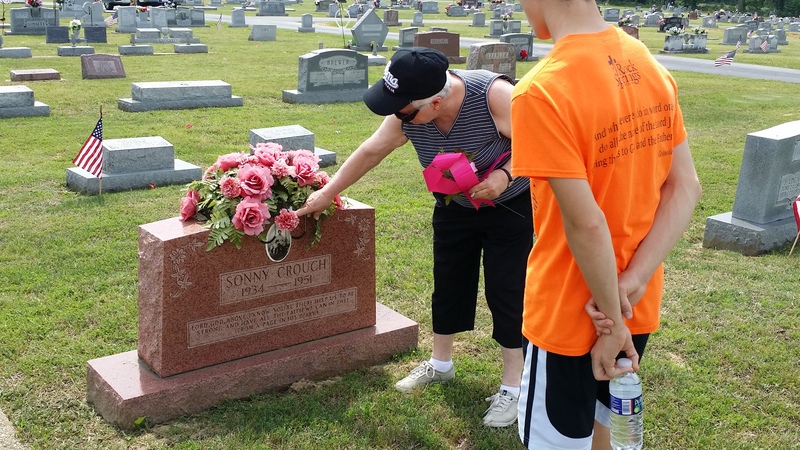 The first day we drove to the Harvey’s Chapel cemetery to place flowers on the assorted graves. As we walked from grave to grave Mom recited stories from her childhood visits each summer to Arkansas from her Michigan home. 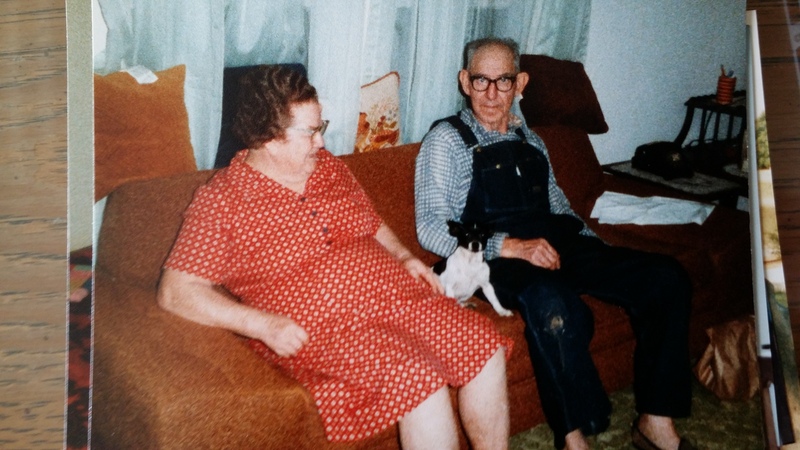 I saw my great grandparents with new eyes and a keener appreciation for what life was like in the 1940’s and 1950’s in rural Arkansas. Mom’s mother passed away when she was only 5 years old giving birth to a baby sister who also passed. Mom at her Mother’s Grave in the Harvey’s Chapel cemetery. 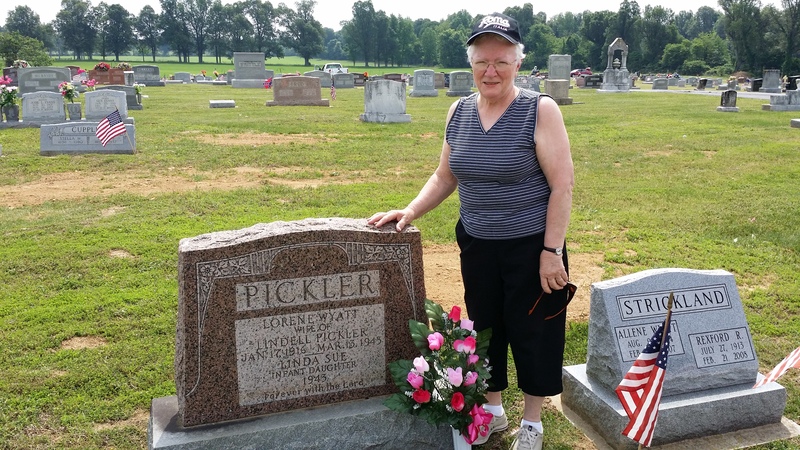 Her mother was Lorene Zelma Wyatt Pickler. 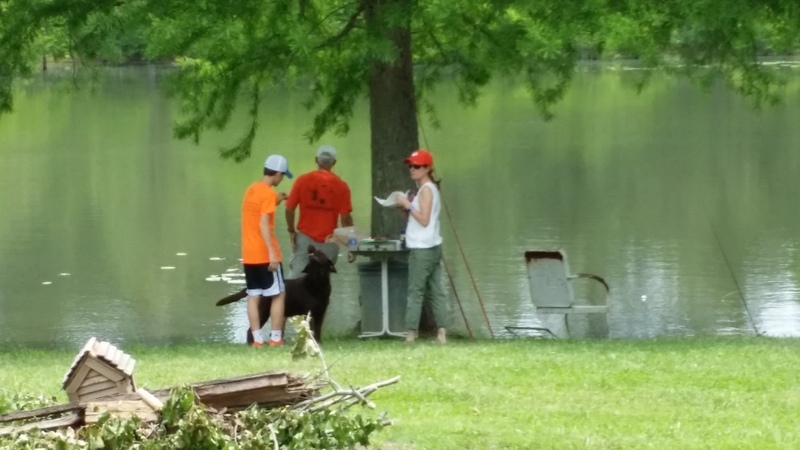 Mom, Joy Pickler Moss, sharing stories from her childhood summers spent in northeast Arkansas. Harvey’s Chapel is in the background. Mom telling Wyatt, her youngest grandchild, about his relatives. Yet Mom’s maternal grandparents, Charles Washington “Wash” Wyatt and Julia Pearl Edmonston Wyatt, were her second family and played a huge role in raising her. 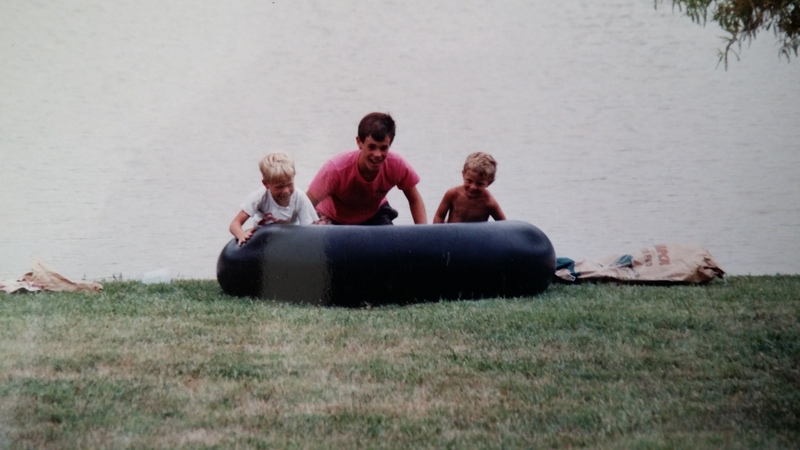 I had their names, basic life details, and pictures from my Ancestry.com research, but listening to my Mom and later several of my cousins, I began to see them as real people with trials and challenges, hopes and dreams, times of loss and times of abundant joy – not much different from you and me. It was like the black and white pictures I have took on color and life while listening to the stories from their loved ones. 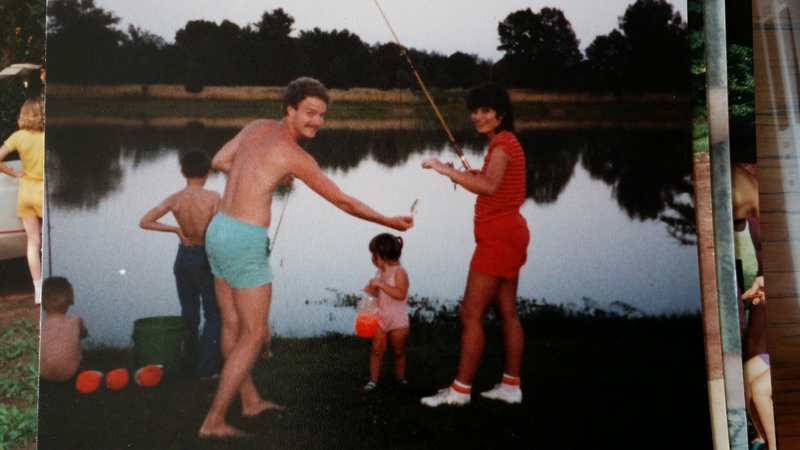 Later that day we headed to Pick’s Pond where, as children, our family would regularly spend the fourth of July Holiday. 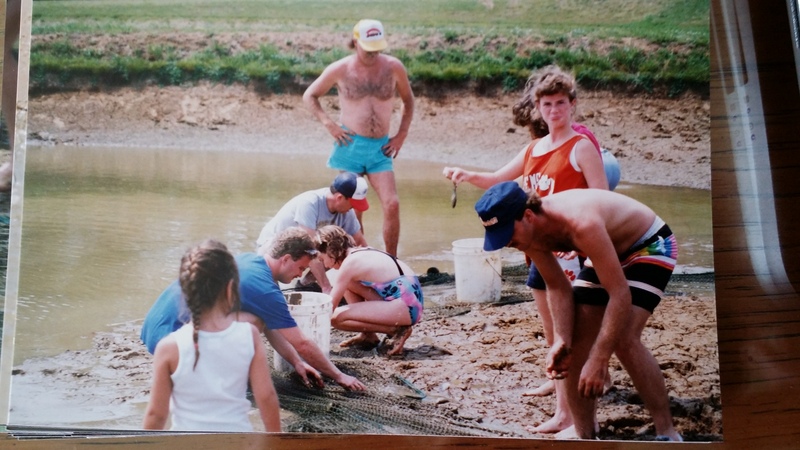 Grandpa Pickler purchased the land and with the help of my uncle Don, built a series of catfish ponds on the property in Crowley’s Ridge near Boydsville, Arkansas for Grandpa’s retirement. 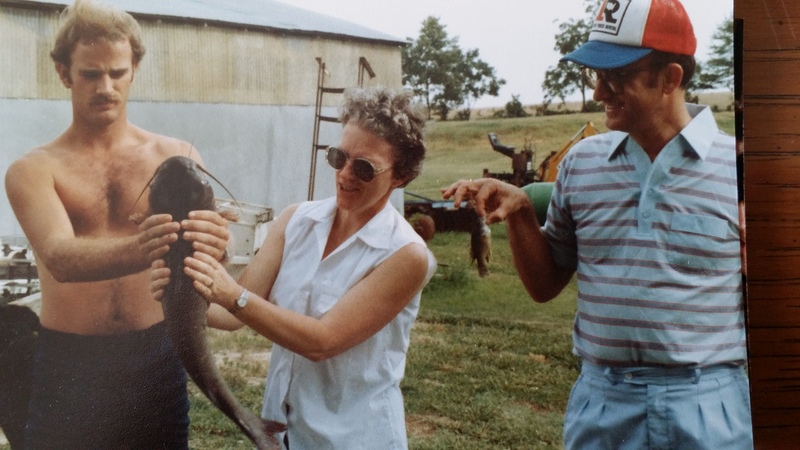 Sadly, Grandpa was diagnosed with Chronic Leukemia in his late 50’s and his health deteriorated fairly quickly limiting the amount he was able to do on the farm. 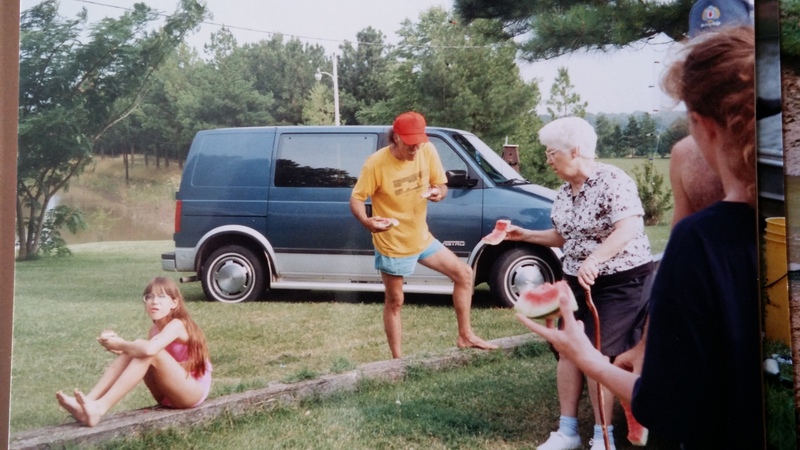 Yet I still fondly remember his fun-loving antics and his love for his grandkids. He always wanted to “tell me a secret” only to get me close enough to nuzzle my ear with his grizzled chin – a trick I now do with my two grandsons. Bo. 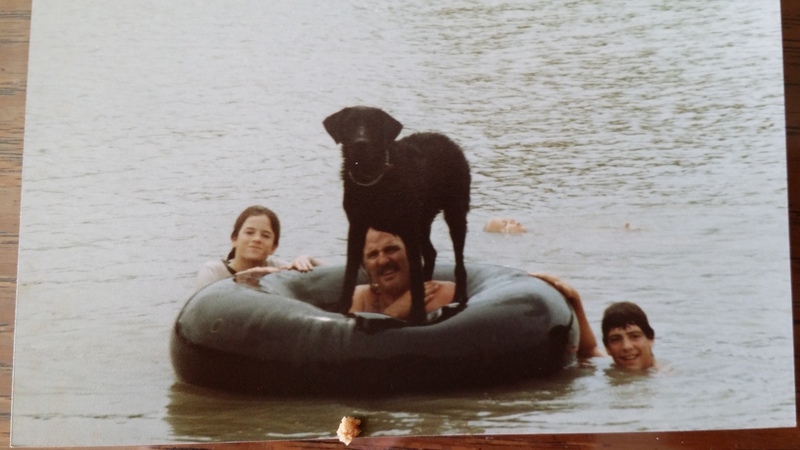 the black Labrador retriever, loved to play king of the inner tube – and he often won. About 1974. 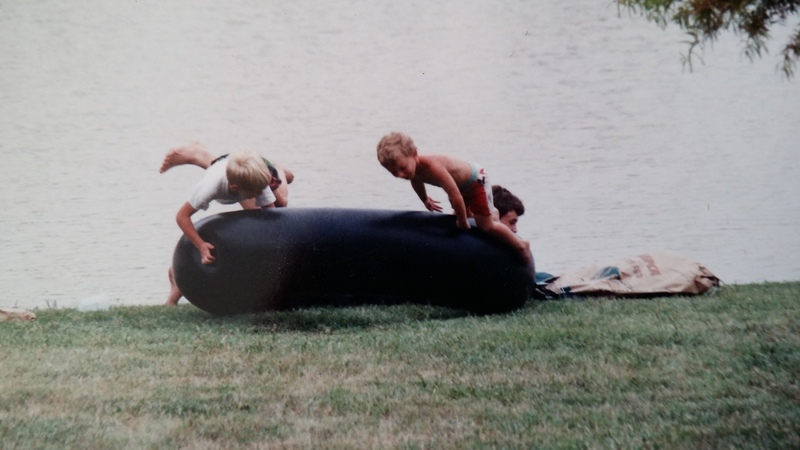 A favorite game of “bounce the boys”. 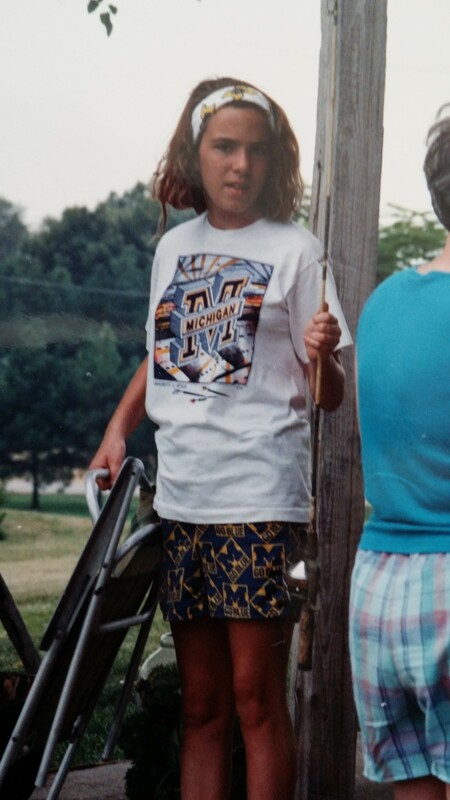 About 1988. Step three of the Game Bounce the Boys. 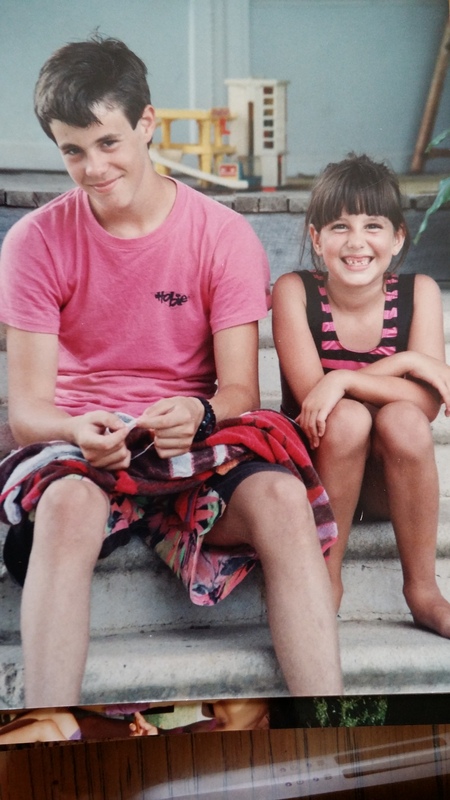 About 1988. Seining one of the breeder ponds. About 1988. 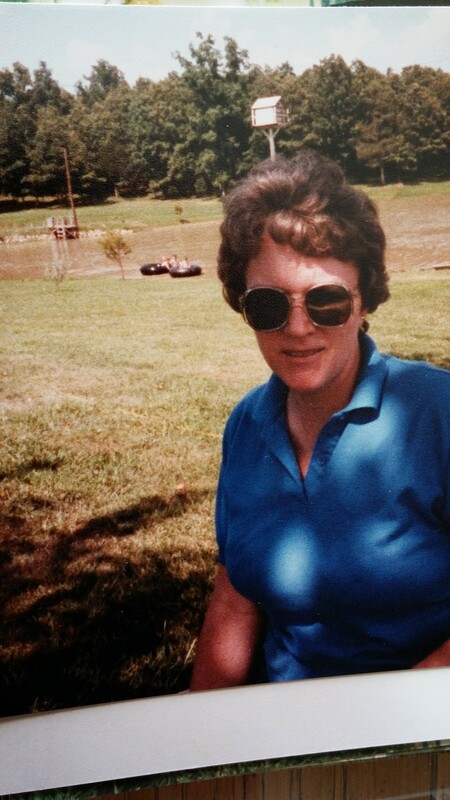 Mom – Joy Pickler Moss, standing in front of the Big Pond at Pick’s Pond. About 1977. The farm at that time was basically a large open field with six ponds on the gently sloping hills. One thing that Grandpa insisted on is planting lots of trees on the property. 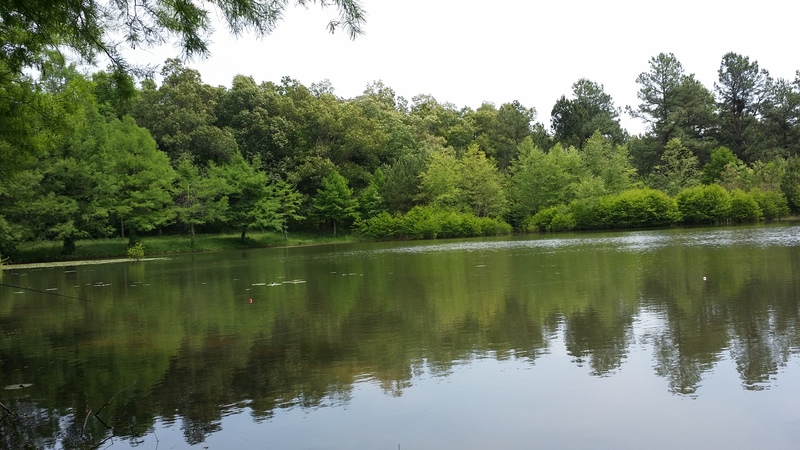 He lined his driveway with “little-bity” pine trees and surrounded the “big” pond with small cypress trees. I feel certain he knew he wouldn’t see these trees grow to maturity, but it was his desire to leave something of beauty and worth for future generations. I was stunned when we pulled into the driveway. 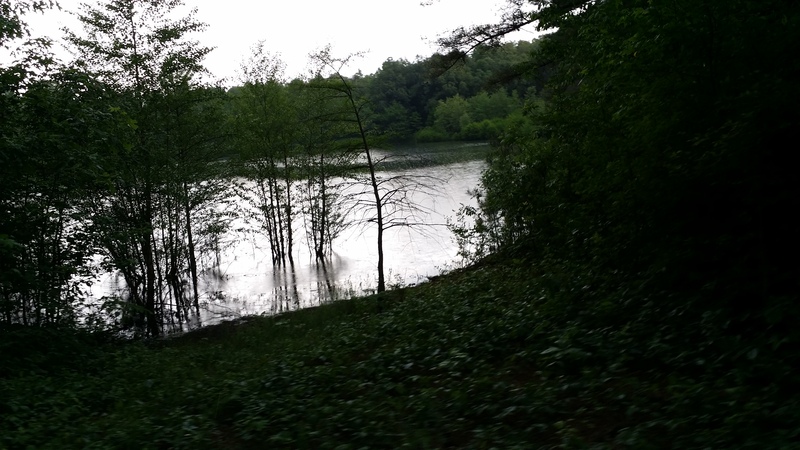 Another view across the Big Pond at Pick’s Pond, Ma 2015. 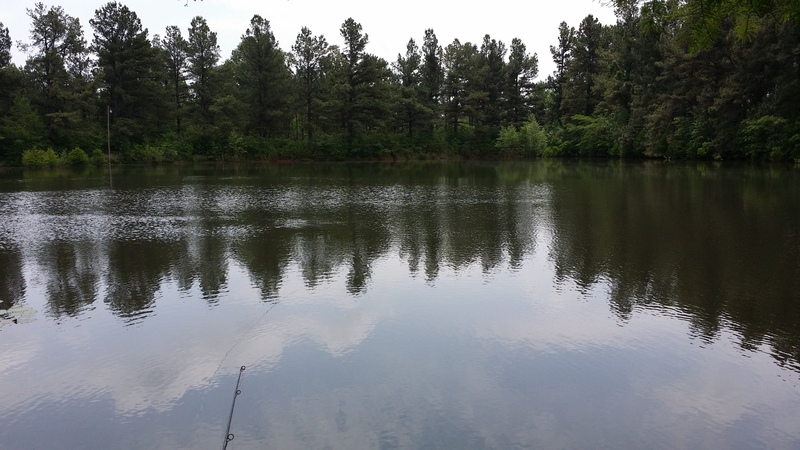 Fishing under the Cypress trees at Pick’s Pond. May 2015. There was no field. Nor were there any little-bity trees. Instead was a beautiful pine canopy over-shadowing the tree-lined drive with forests on either side. An even more amazing sight awaited at the big pond where Grandpa’s cypress trees now soar above the shoreline providing shade respite from the brutal summer sun. 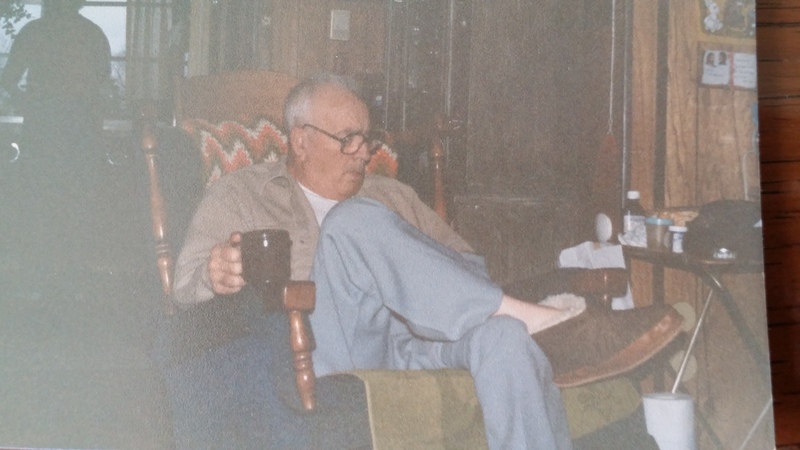 Grandpa Pickler around 1975 – 1977. My heart was full of thankfulness for my Grandpa’s vision and desire to make something beautiful for those of us to follow and for my uncle Don who helped Grandpa turn his vision into something tangible. The next vignette came on Saturday evening when we gathered at my first cousin Kelly’s home in Piggott, Arkansas. Since Kelly was a lot younger than me we did not play together a lot as children. As we drove up I saw the landscaping Kelly and her husband Jamie had installed and we had an immediate connection that I didn’t realize existed. I enjoy landscape design and making those designs become a reality. 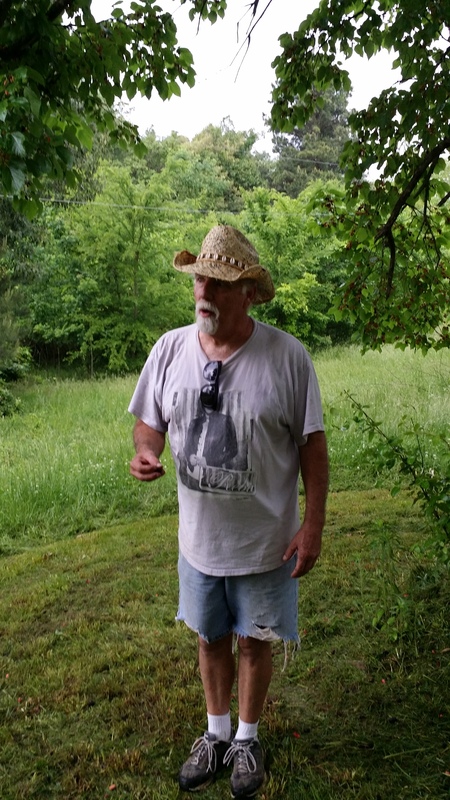 We talked extensively about plants, landscaping, and the challenges of our hobby. Today instead of being simply my younger cousin with a husband and two fine sons, my relationship with Kelly has taken on depth and life through our similar experiences and passion. This theme repeated itself throughout the weekend as I met new family members, 2nd and 3rd cousins, who shared some of the same interests and tastes as me, but had experienced life in a much different place and time. The sense of what a small world we live in and the impact of shared DNA was really fascinating. 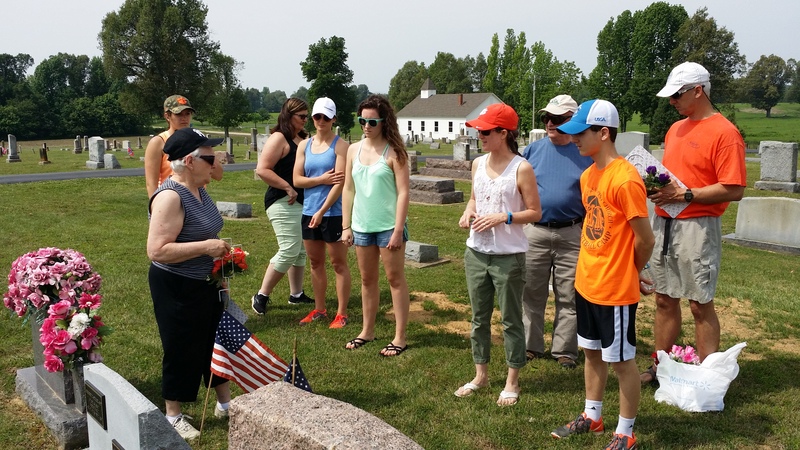 Our final event was the Memorial service at Harvey’s chapel on Sunday morning. The chapel is now only used this one weekend a year. I guess it seats about 60 or 70 folks comfortably. With the rain showers that began about 45 minutes prior to church time, I wondered if the crowd would be pretty sparse. As we entered it was definitely a throw-back to simple days and the small country church. My sister said she was half expecting Laura Ingalls from Little House on the Prairie to slip in. As 10:30 arrived I looked around and happily noticed that the church was almost filled in spite of the nasty weather. The service was camp meeting style with songs and order of service a good bit different from what I am used to. But there were a number of things that were welcome touch-points for me. The scripture used was the same tried and true Word of God that I read every day. The verses were familiar ones God has used numerous times to guide, strengthen, and challenge me in the past. During the invocation the speaker quoted CS Lewis, one of my favorite authors. But the thought that sticks with me is that my ancestors over 150 years ago met in this same place seeking to establish a community of faith. One relative donated the land. Another relative started the church meetings in their home. Many others made up a large portion of the congregation. Even the current Memorial fund which helps keep the grounds maintained and the building in good repair has been funded in large part by other relatives. While the community now gathers at other newer and larger churches on Sundays, the fact remains the roots for those churches are the small country churches like Harvey’s Chapel and they stand on the legacy of our forebears in the faith. The lessons reiterated from the weekend. We are connected to the family of faith throughout history. Those that have gone before us sweated, cried, cheered, prayed, and lived so that those following would have a place to stand… a place to live… a place to worship God. We are more alike than we realize and God made us that way intentionally. God is most interested in relationships. Person to person, but especially person to living Lord. Strive to really get to know the people God places in your life. Ask God to make those connections from which relationship grows. And out of those relationships, the life of Christ can be shared. We may not always fully comprehend the purpose for the events of our life until much later. In fact when the group met in the Edmonston’s home in 1859 for the first time as what would become the Harvey’s Chapel congregation, I would be really surprised if anyone spent much time thinking about the fact that in 2015 a group of 60 believers from all over the US would still be meeting in the church they would birth. Jesus talked about faith the size of a mustard seed, though extremely tiny, able to produce amazing results. I saw that this weekend in a little country church and the families that have lived, loved and served the Lord in a steady faith. Have a blessed day and be a blessing to someone today. A few more fun pics from Pick’s Pond. Don explains why these mulberries taste so much sweeter. It’s the fertilizer. This tree sits over the old outhouse. 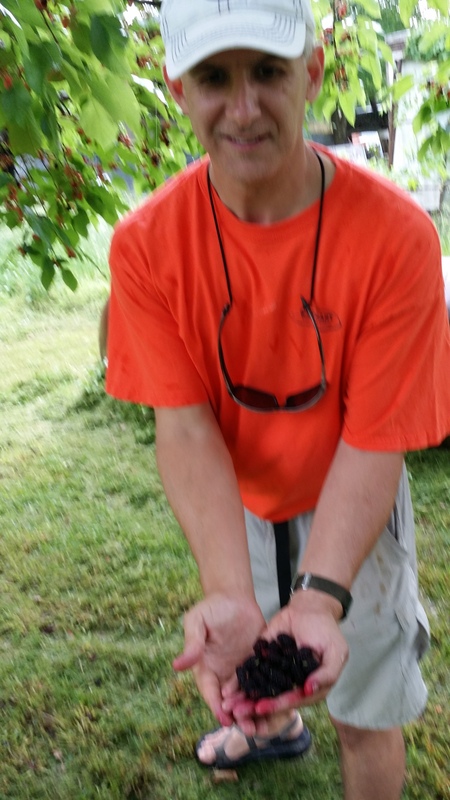 Keith’s double handful of sweet mulberries. 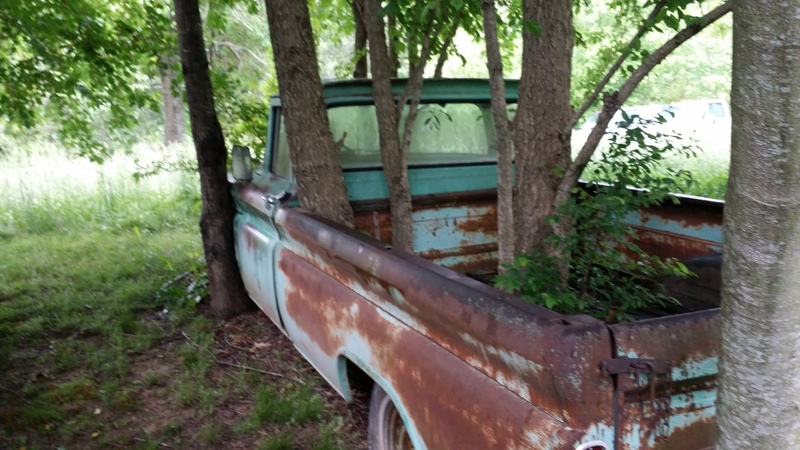 I think Don left the truck parked there a little too long. Cousin Anna, Don Pickler’s youngest daughter. Mom wins the fishing contest this day. Day is awfully proud of his entry although I don’t remember why. Sister, Julie Elizabeth Moss Denton, and Cousin, Kelly Robinson Wilson. 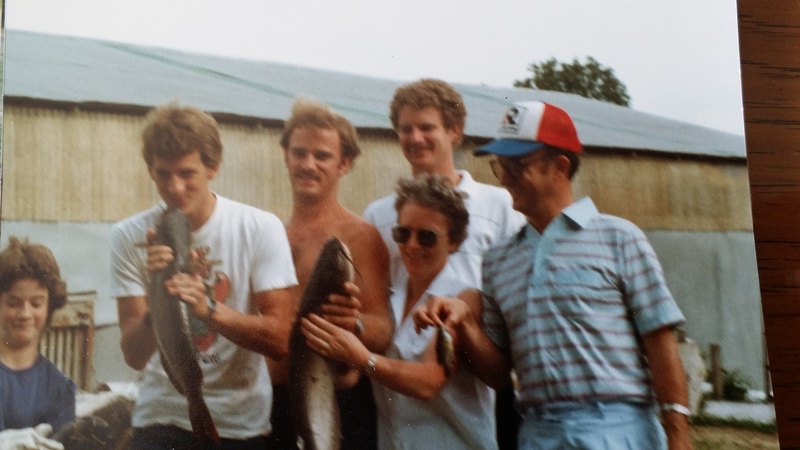 My parents and siblings with our entries in this day’s fishing contest. 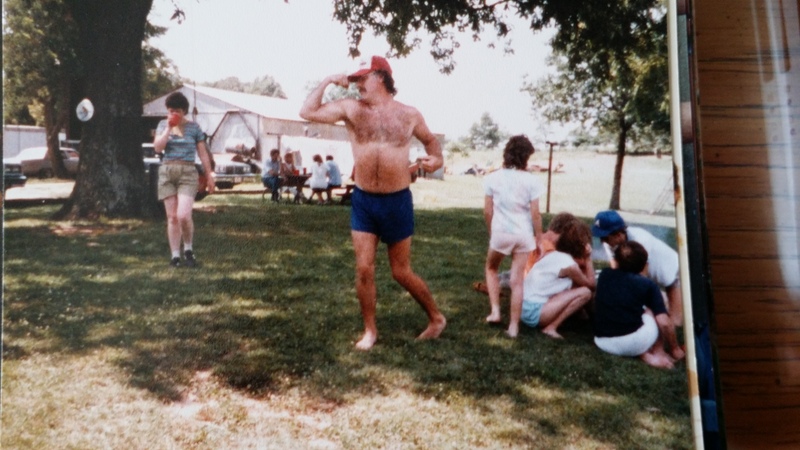 Uncle Don shows off his physique. Keith and Julie. Keith’s description of an Arkansas 4th of July trip. “Go to Grandma’s. 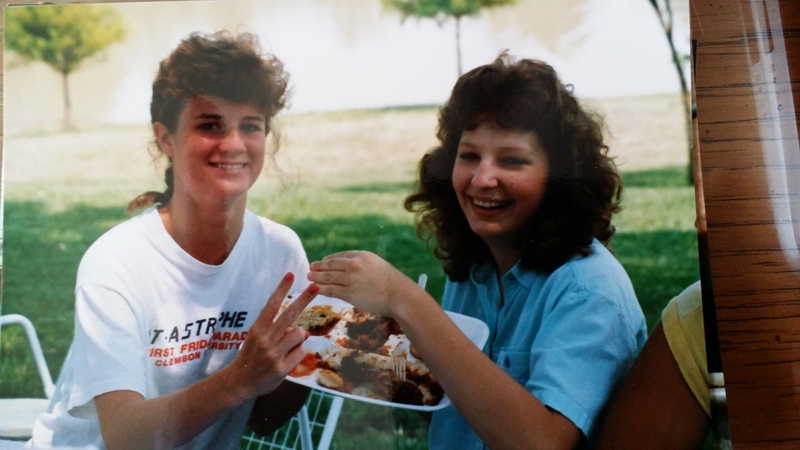 eat a biscuit, and sweat!” July 1989 I think. We ate watermelon until just before it started growing out our ears. Cousin Jason and my oldest daughter, Rhiannon. About 1988. 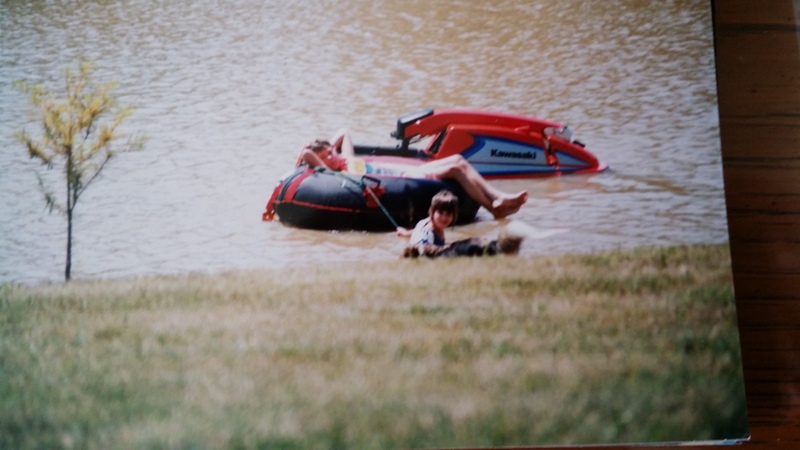 Eric’s jet ski on the big pond. Jason prefers Rhiannon power though. 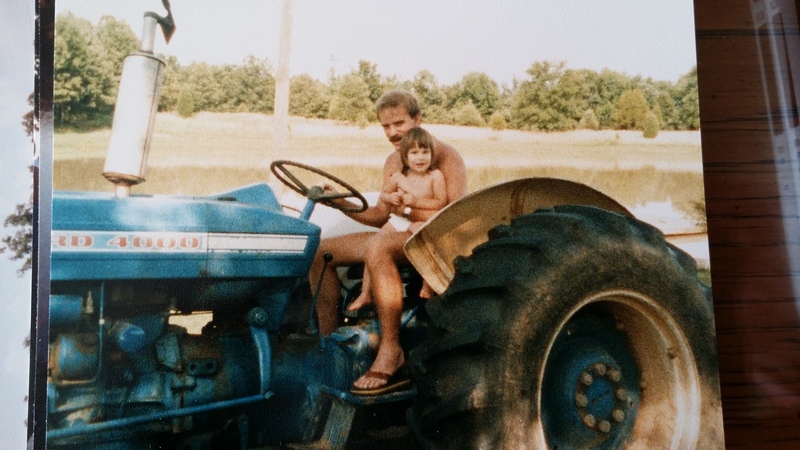 Eric takes Rhiannon for a ride on the big tractor. Aunt Allene was Mom’s Mother’s sister. This is Aunt Allene and Uncle Rex’s 50th wedding anniversary. 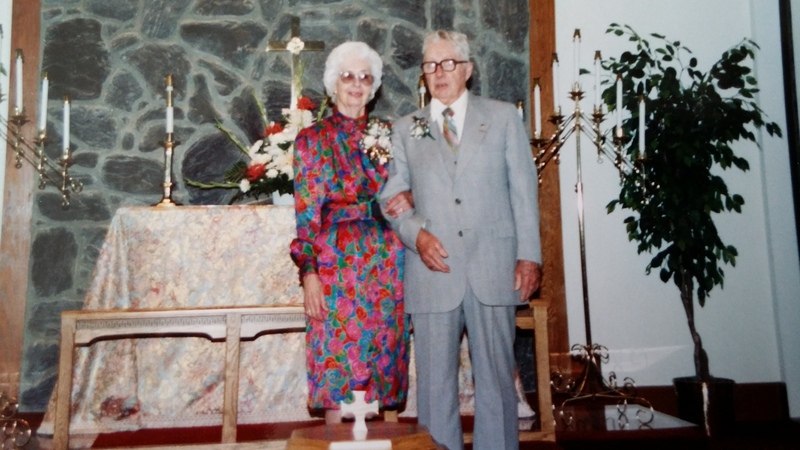 Aunt Fay and Uncle Roy. Fay was Grandpa Pickler’s little sister. Dad, John Moss and my lovely wife, Lisa. This is about one year into our marriage. We just reached 30 years of wedded bliss last month. Today several of our friends are going through hurricanes in their lives. A precious 2 year old succumbed to cancer yesterday. Another friend lost her only brother who leaves behind a wife and two young daughters. Other friends are dealing with struggling relationships – marriages being attacked and threatened. These painful events are akin to the wind, rain, and battering waves that threaten to destroy beach, buildings, and any soul who mistakenly wanders out into the storm. Jesus talked about exactly these sorts of situations and He used a weather metaphor to do so. In Matthew 7:24-27 Jesus describes the wise and foolish builders. I am an engineer so I know that there are many steps in building a good, solid house. Jesus really emphasizes only one point in this story – the foundation. You can do everything else in home construction perfect, but if you have a poor foundation the home will not stand when the earth shakes or the severe storm hits. Jesus and His teachings are the only truly solid foundation for life. For some storms in our lives Jesus will step in and calm the storm… the layoff passes us by, the diagnosis is marvelously / miraculously wrong, the wayward child comes to their senses and returns home. For many storms though the Lord, in His infinite wisdom, chooses to walk with us through the storm rather than still the storm. The promise of scripture and the experience of followers everywhere is that if the Lord doesn’t calm the storm, you can be certain He is with you in the storm. That is my story. Jesus’ peace, comfort, and grace have sustained and carried me through every storm I’ve experienced. And on the other side I am a better person with a stronger faith because of it. I have been in a particular storm for the past year plus, but I see the end of this storm on the horizon and I am excited. As I’ve written the bands of wind and rain have continued to sweep through and yet I feel joy in my heart as if it where a beautiful, spring morning. I know Him who is the foundation of life and He is my strength and shield. I don’t know where you are in your life, but there is a truth our pastor says fairly frequently. “Whoever you are you can be certain one of three things is true. Either you are in a storm, you’ve recently come through a storm, or there is a storm in your future.” This would be pretty discouraging IF we didn’t have a sovereign God who knew how to bring good out of every storm and Who walks with us through them. If Jesus and His words are your life foundation, then join me in praising Him in the rain. If you do not yet know Him, please comment to my blog and I will be happy to reach out and introduce you to the Lover of your soul who wants to be your foundation. Ask the Lord to help you know Him. Also pick up the bible and start reading. The gospels are the best choice, but I would be happy to correspond with you and give you some suggestions based upon your life situation. Be blessed today and be a blessing whether you are in the sunshine or in the rain. This morning as my wife and I finished our devotion we moved into prayer for friends and family who are going through serious challenges. In particular we prayed for couples who are striving to reconcile their marriages after betrayal and hurt. A picture that came to mind as we were praying is that of a deep wound that must heal from the inside out. I spoke with a friend recently who has suffered a very serious injury losing the ends of three fingers. The doctors are leaving one of the wounds open so that it will heal properly – from the inside out. Coming back to the picture that came to mind as we were praying, I believe that this was a word the Lord gave of what has to happen in these couples we know although it is true of anyone who has suffered deep hurt. The emotional wound has to have time to heal. Words and superficial actions will not bring the healing that we truly need to be made whole. In a marriage a demonstrated commitment is essential for this healing. Practical steps in this are striving to know and understand our spouse better and better, seeking to understand and speak our spouse’s love language, putting our spouse and their needs before our own, and walking in the character trifecta of openness, honesty, and integrity. These same truths apply to other relationships as well, but marriage is indeed a common relationship crucible for many of us. Sadly, for many marriages the refining fire beneath the crucible doesn’t have to get too hot before the majority of what we have built our life upon becomes ash. Yet through this God is able to build something truly valuable with the little that is left and adding His all-sufficiency. You see I know this from personal experience. My wife and I celebrated 30 years of marriage last month. As I look back I can honestly say that over those 30 years we have had 29+ years of very good to amazingly great love and life together. But there have been times… A little over three years ago our relationship had become quite strained. My job had me on the road 70% of the time. Lisa was focusing more and more on her career and when I came home looking to be pampered a little bit (okay maybe I was looking for a lot of pampering) Lisa was about used up from all the extra she was having to do. Our communication suffered and frankly the love was a rather dim ember at that time. Even the close friendship that we have always shared was being severely tested. At Christmas we had booked a condo in Orlando assuming Sammy’s soccer team would be playing soccer between Christmas and New Years as they had done for four years previously. Surprise, they decided not to play in that tournament and yet I had the condo rented. The short story is it was not the relaxing time to refresh and rejuvenate that I had hoped for. In fact we now refer to it as the “vacation from hell.” That is not a direct reflection on Orlando necessarily, but more on our heart condition at the time. I allude to this story today because one of the residuals from this is a serious scar around Lisa’s leg where the tissue was so seriously damaged. Two things the doctor later told us that we look to as a testament of God’s grace. First when he first saw Lisa’s leg he estimated he had a 50/50 chance of saving it. Yet her healing progressed very well. In fact he seemed very pleased and even a little surprised at how well she recovered. Second at her one year check up he fully released her telling her to listen to her leg and let pain and discomfort tell her how much to do. (Oh he did forbid her from swinging on rope swings too.) But he also said, that a break as bad as hers 50 years earlier often proved fatal. The bones were shattered into so many small pieces and the wound was a terrible thing. As we finished our prayer time and I shared the picture that I had used in praying for our friends, Lisa thought of her leg and pointed to her scar. And she said that deep wounds can leave bad scars. She was mostly right, but I don’t see her scar as bad. To some it may not be pretty, but to me it reminds me of Gods abundant grace. Lisa lived. Lisa kept her leg and she has most of her mobility. 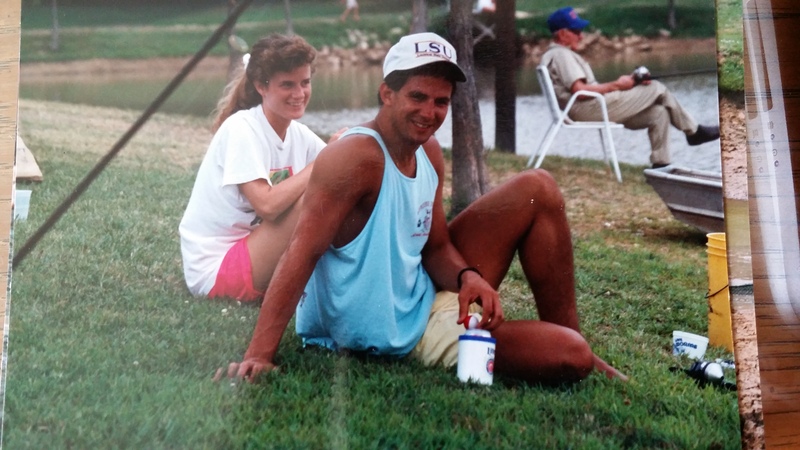 Our marriage was healed because when Lisa broke her leg, God broke my heart. Our oldest daughter who had been estranged from us for a time not only came rushing back to be with her mama, she gave her life to the living God. She will live with God in His kingdom and the catalyst for her final step to this decision was Lisa’s broken leg. One final thought. I went for a run after we finished our devotion. I love to run and I had stopped for a couple of months, so it was exhilarating to get back out there. But I don’t run for the sake of running. I run so I can talk with the Lord. He did not disappoint. I pick up small rocks as mementos of the places we’ve travelled. (Lisa is wrapping up a business meetings here in Myrtle Beach as I write this post.) You may agree with Lisa and think it’s a little weird, but I have found a few other persons who share this weirdness. Anyway I am on the return leg of this long run and I have picked up a couple good rock candidates for my collection when I feel the Lord speak to me to stop and look for a rock. Now I like fossil rocks or intricate design rocks or even pretty rocks – something that stands out. So as I stand by this puddle I am thinking, “Are you going to show me a gold nugget or something Lord?” And I started looking for something special. But the Lord said, “Look in the muck and mire. Look for the dirty and overlooked. Get the rock that looks the least appealing.” So I looked and sure enough there was a little, ugly black rock. I picked it up and as I evaluated it I decided it is a possibly a small piece of shell encased in a little bit of asphalt. I thought, “Wow, no gold nugget here.” To which the Holy Spirit immediately replied, “Everything can be redeemed!” My mind went to the description of the heavenly city described in Revelation of the streets of gold and I realized that streets of gold will have an underlayment that support them and keep them strong, flat, and beautiful. An underlayment that can include little pieces of shell encrusted in small chunks of asphalt. Friend, I do not believe you are reading this by accident. I feel that the Lord has a message of hope for the world that He will get out through as many means as possible. This message is meant for you and perhaps a loved one or friend. God loves you, He can bring about the deep healing that is needed, scars aren’t always bad, and everything can be redeemed. That about sums it up for this morning. Have a blessed day. And be a blessing to someone God puts in your path or on your heart today.